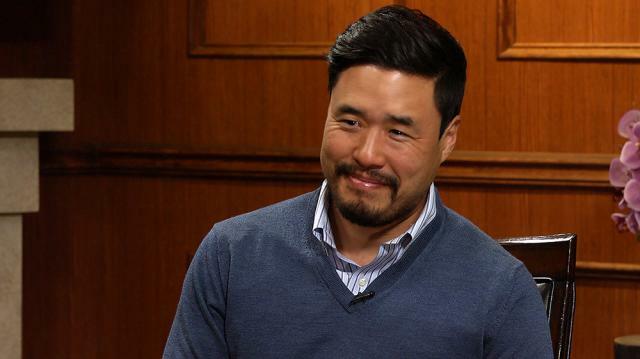 Randall Park is on a roll. The ‘Fresh off the Boat’ star talks the unlikely success of the ABC comedy, how ‘Veep’ made a difference in his career, & why he didn’t expect to make it in Hollywood. Plus, ‘The Interview’ actor on connecting with Kim Jong-un. Larry King interviews Randall Park, an actor, writer, director, and comedian who has had roles on ‘Veep,’ ‘Office Christmas Party,’ ‘Trainwreck,’ ‘Fresh Off the Boat,’ and as Kim Jong-un in ‘The Interview.’ The season 3 finale of ‘Fresh Off the Boat’ airs on May 16, and Park will also be in the upcoming comedy ‘Snatched’ with Amy Schumer and Goldie Hawn. Larry asks him about his role on ‘Snatched,’ and Park says he plays Schumer’s boyfriend who dumps her to find success with his band, and their breakup is the catalyst for her adventure. Larry mentions that Park has played good and evil roles, and Park says he likes playing evil more because he’s able to make it seem good. Larry agrees, saying how nobody evil thinks they’re evil, which is a fun thought Park likes to play with. They talk about Kim Jong-un, a role Park auditioned for, and Park talks about identifying with Kim Jong-un’s desire to please his father, which is a common theme among children of immigrants. As the son of Korean immigrants, Park talks about growing up in west Los Angeles. King asks what took so long for a TV show starring Asian Americans to air again, after a cancelled Margaret Cho show 20 years ago. Park attributes it to racism, and talks about how the opportunities and industry system weren’t there. King asks about Park’s initial skepticism that the show wouldn’t last beyond the pilot, which Park chalks up to seeing other shows about Asians fizzling.